Real world blimps are dangerous, unwieldy death traps that have a history of exploding over heavily populated areas. Strangely enough, it's for these exact reasons that piloting a virtual blimp in Grip Games' Blimp: The Flying Adventures equates to one of the most enjoyable and downright addictive titles in the PS Mini library. 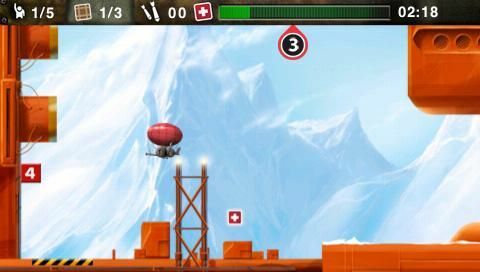 Originally developed for the iPhone and iPad by Craneballs Studios back in October 2009, Blimp: The Flying Adventures is the latest in a long line of Lunar Lander-esque piloting games that tasks players with navigating a finicky dirigible through obstacle-ridden landscapes and death-defying scenarios. Doing so requires players to use basic thrust and steering controls in order to maneuver the blimp safely through 20 levels while completing various objectives such as shuttling passengers between landing pads, collecting supplies, escorting prototype blimps and laying waste to enemy units. Controlling the blimp is deceptively simple. Players use the left analog stick to steer (or the 'nub' for PSP owners), the X button to apply gas, and the shoulder buttons to drop bombs. Easy right? Wrong. Dead wrong. Despite a few softball levels in the beginning, Blimp's difficulty curve climbs drastically around the midway point, forcing players to use the thrust and directional controls in exacting measures or risk bashing themselves to oblivion. Truly, Blimp: The Flying Adventures is a game made up of equal parts skill and anger management as many of the later levels require map memorization, finely-honed motor skills and the patience of a monk. One ill-timed burst of speed can set off a chain of collisions that takes you back to the beginning. This is especially so in levels where the physical boundaries are far more constricting and the enemies far more likely to be placed at the worst possible locations. It should be said that Blimp doesn't come by all of its difficulty honestly. The blimp's slippery movements don't work well within a crowded 2D environment, and without any recovery time between damaging hits, it's all too common to lose a good chunk of health due to one bad bounce or by grazing an enemy you didn't see two seconds earlier. Even combat is something of a chore due to the fact that it’s nearly impossible to place a well-aimed bomb without taking two or three in return. Some of these grievances aren't as pronounced in lower difficulty modes, but even on its easiest setting – which mercifully takes away the time constraint – it's far too easy to ruin a good run with one small slip up. Thankfully, one won't mind replaying the levels. From the lush, overgrown forests to the snow-capped air stations and dune-like deserts, each of the game's stages is crafted with richly detailed backgrounds and sharp, colourful foreground images. In contrast, the blimp itself looks like a low-res sticker moving through breathtaking landscape photos. The overall atmosphere is bolstered by trippy musical tracks that trade standard high-energy videogame pop for layered, zen-like compositions. Sure you may die a lot, but at least you won't mind making the repeat visits. As far as story goes, Blimp tells the harrowing tale of some war with some guys who are threatening to rebel against some other guys... or something. To be honest, it’s easy to forget why you're shuttling scientists or collecting random plot MacGuffins, only that you must do so to fulfill the level's requirements and move on. To its credit, Blimp certainly tries to tell a story, but the way it does so – with static, black-and-white panels pasted between each stage – seems undercooked when compared to the rest of Grip Games' and Craneballs Studios’ talented efforts. Braggarts will be happy to hear that Blimp also includes a global leaderboard system, although not one that can be accessed via the PS3 or PSP. Points are tallied based on time elapsed, damage taken, damage inflicted and other in-game achievements. After each stage, players are given a code that can be inputted on Grip Games' website, which then posts the corresponding score on the developer's personal leaderboards for the world to see. It's a nice touch, but a few too many steps for the average gamer. It's a shame that Blimp: The Flying Adventures has flown under the radar on iOS systems, but maybe an appearance on the PSN might be what it needs to get its gaming wings. Addictive, challenging and very easy on the eyes, Grip Games has crafted a PS Mini experience that deserves a spin. Just, you know, go easy on the gas. An addictive, underrated iOS game gets its wings on the PSN.